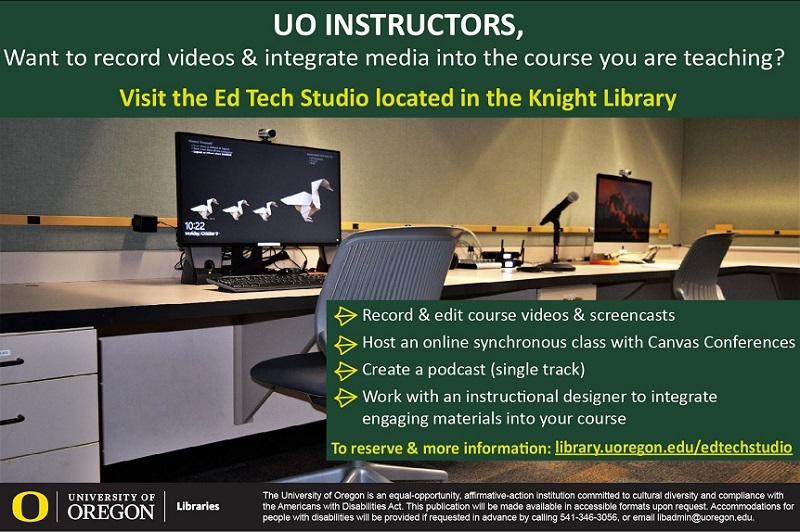 The self-service studio, located in Knight Library room 33 is a soundproof room designed for instructors to create videos, podcasts, and host synchronous virtual sessions for their online and face-to-face courses. The studio includes video equipment and software to create, edit, and integrate videos into your course. Additionally, with the help of our instructional designers and ed tech specialists, we can provide the technological and pedagogical expertise for creating engaging materials and integrating them into your course. The Ed Tech Studio is available anytime the CMET front desk is open. Academic Term: Mon-Thurs, 7:30 AM - 6:30 PM; Friday, 7:30 AM - 5:00 PM. Navigate to LibCal for current availability & to book the space. To setup reoccuring bookings, please email at cmet@ithelp.uoregon.edu. If you need any assistance or have any questions about availability and booking the studio, please contact the CMET front desk at 541-346-3091 or email at cmet@ithelp.uoregon.edu. USB or external hard drive for storage; at least 4GB of available space is recommended. ​How to get help/reserve time with an instructional designer? We highly recommend reserving time with one of our instructional designers to help orientate you with the studio and best practices and specific help on creating and editing videos. Make an appointment with Pat Fellows or Karen Matson, or email lms@ithelp.uoregon.edu. Our instructional designers will coordinate with you to reserve the studio and help accomplish your teaching goals.